Good for you! With help from the dentists at Flenniken Family Dentistry, you have restored your smile with dental implants. Now that you have dental implants, here’s how you can make sure they’ll last for many years to come! Why Pay Special Attention to Dental Implants? Properly caring for your dental implants can make them last longer. Actually, implants will last a lifetime if you are careful about cleaning and hygiene. Just like your natural teeth, the condition of implant-supported teeth depends largely on the health of surrounding tissue. Did you know that plaque can accumulate around a porcelain crown just like it does one of your own natural teeth? If plaque is left in place for too long, then a condition similar to gum disease may develop. Called peri-implantitis, this bacterial infection affects the connection among the implant, your gums and the bone. In severe cases, peri-implantitis can lead to bone loss around the dental implant. If this happens, you may need to have the implant and tooth restoration extracted. So, removing plaque with twice daily brushing and once a day flossing is imperative. Your Carlisle dentist may recommend floss designed especially for cleaning dental implants. When you brush your teeth and dental implants, be sure to use a toothbrush that has soft bristles. Hard bristles are more like to scratch the enamel surface of your teeth as well as your porcelain restorations. You don’t need to switch from a manual to an electric or battery-powered brush. Whatever you’re most comfortable with is best. Floss in between your teeth and implanted tooth restorations. Be sure to floss all the way down to the gum line in order to remove any debris and plaque that may be building up. You may want to add an oral irrigator or water flosser to your oral hygiene routine. These have been shown to reduce the risk of inflammation due to plaque buildup. Use your water flosser once or twice a day. In addition to maintaining a strict oral hygiene routine at home, scheduling regular dental checkups every six months is very important when you have dental implants. Our dental hygienists can use special hand instruments to thoroughly clean around your implants. If there is any plaque on the restoration, we have the removal tools that will not scratch the surface. Enjoy your new smile and be sure to take good care of your dental implants! Your Carlisle dentist is always here to help. The dentists and their team at Flenniken Family Dentistry offer a complete menu of dental services for you and your family. 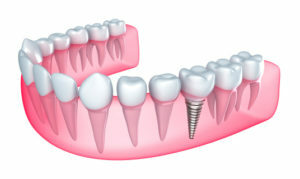 Dental implants are only one of the many treatments available to rebuild your smile. Contact our office today to schedule a consultation.